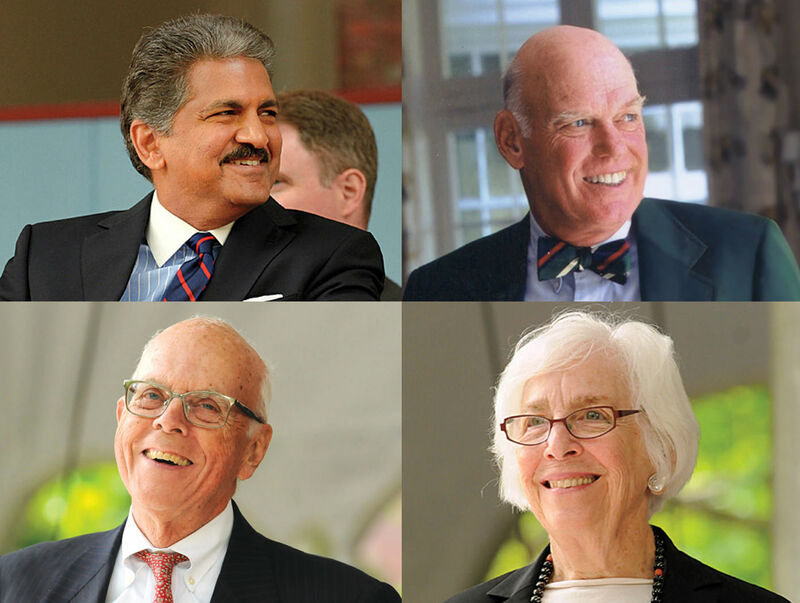 Clockwise from top left: Anand G. Mahindra, J. Louis Newell, Emily Rauh Pulitzer, John P. Reardon Jr.
Anand G. Mahindra ’77, M.B.A. ’81. Distinguished graduate of Harvard College and Harvard Business School, you have served the University on several continents with deep devotion and insight, affirming the vital importance of the humanities while advancing interdisciplinary studies within a broad liberal arts education. J. Louis Newell ’57. Whether cheering from the stands at the Stadium, or chairing the committee charged with making Commencement happy, you stand always ready to answer Harvard’s call, as a stalwart leader of your Class, the Harvard College Fund, the Harvard Club of Boston, and the Harvard Varsity Club. (Newell could not be present; he will receive his medal at a later date). Emily Rauh Pulitzer, A.M. ’63. As Harvard Overseer, expert in modern and contemporary art, and devoted friend of Harvard’s art museums, you have elevated the University and its embrace of creativity through your profound belief in the power of art and education to transform how we look at the world. John P. Reardon Jr. ’60. From Admissions to Athletics to Alumni Affairs, you have shaped the Harvard we know and love, touching and changing countless lives through your skillful leadership and sage counsel, your impeccable judgment and inimitable way with people. The whole Harvard family salutes you—and thanks you.